Can you believe it, December already, oww that gives me an anxious feeling. That well know phrase springs to mind ' So much to do, so little time'. The current Crafty Boots Challenge is 'See the Woods for the Trees' and it has given me the perfect excuse to make a couple of much needed Christmas cards. This gorgeous stylised Christmas tree is from Delicious Doodles. I coloured it with Promarkers and added glitter to the decoratons and deep red gems. It is so sad the glitter does not show up on this photograph. I mounted the image on some silver mirri and also on some Real Red card. I found the fabulous backing paper in my stash, the sentiment is from Craftwork Cards and the flowers. leaves and berries are from Wild Orchid Crafts. 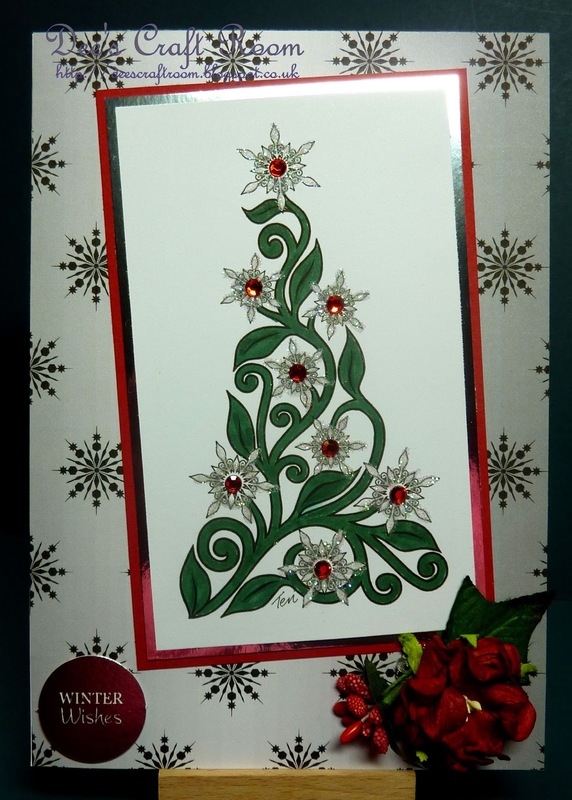 Don't forget to enter your Christmas tree designs in this Crafty Boots Challenge. No worries about the email Pamellia, when ever as the young say. I hope you are OK though. Thnk you for your wonerful thoughts. Thank you Carol. I was so pleased with that backing paper, it is such a good match, but I cannot remember where I got it from. I often buy downloadable paper packs and I remember printing this one when I was making a wedding card last year. In the end I did not use it and it has been in my stash ever since. This is such a stunning card. Love everything about it. I have missed a few of your awesome creations because blogger only lets me see the current day blogs and won't let me see previous postings. On my phone I can see previous posts past day 1 but not on my computer. I don't know how to fix it and it's frusturating because I miss alot of the blogs I follow. Excellent card one of your best! Thank you for your lovely comments. I think the backing paper really helps with this card, just goes to show how important the little things are. I am sorry to hear about your blogger problems, I am afreaid I have no idea how to fix something like this. Thank you. The stamp was a freebie, I belong to the Delicious Doodles Facebook page and every so often Teri gives us a little treat, this one is really fabulous, isn't it?